Gaining root access to your server can be a bigger deal then you may think. It does give you ultimate access to everything regarding your server, in both WHM and via SSH as well. Please keep in mind that you may not need root access to perform your everyday activities. This article requires you to already have a VPS or Dedicated server plan. To make sure you are on the correct plan you may find out what server you are on. If you're familiar with managing a Windows server, you know then that the Administrator can edit any files on the server and perform any tasks they need to. Linux has a similar administrative account, but it is named "root" instead of "administrator". 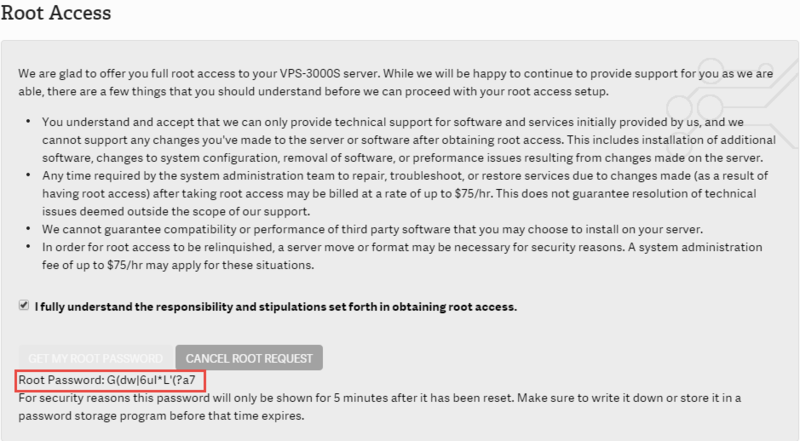 Root access is not given by default on VPS or Dedicated Hosting Accounts. Because the root user can do anything they want, the level of support we can offer varies slightly for accounts that have root access. Because of this, we require users to accept our Root Access Disclosure before we allow root access to their servers. Find the icon for Request Root Access and click on it. Read through the agreement prior to checking the box stating you understand the responsibilities of having root access. Click the button for your root password. After a few seconds you will see your new root password below where the buttons are. Find the icon for Change Root password and click on it. Click Reset password and your new root password will be shown below the button. Can reseller accounts get root access? if so, how? Unfortunately, reseller accounts are not able to gain root access. This level of access requires you to already have a VPS or Dedicated server plan. To make sure you are on the correct plan you may find out what server you are on. Can i go back? Unrequest it? You may request to revoke your root access, but the Systems team would need to do a platform reset. This generally costs about $120 USD. Once the request is made, since root access is issued immediately, you cannot cancel the request. Hello, How I can cancel root request? Hello, is it possible to give SSH root access to a user? If yes, can the user still uses cPanel to log in? - I heard root users cannot use cPanel directly but only WHM. Also, do you still provide normal support for initial software, cPanel/WHM etc. after root access is granted? Thanks for the question about root user. There is only ONE root user in our installations. See the cPanel Support Community post on this same question for more information. 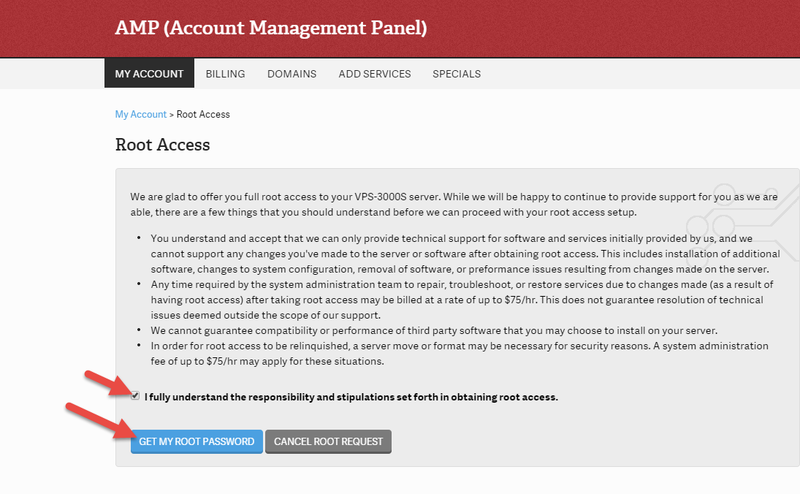 Root users can access any cPanel in WHM (just click on List Accounts, then select the cPanel they want to view). Yes and no. If you have root access to your server, you can still contact our Support Team at any time if you need assistance. The problem that arises however is that if you have root access we may not be able to easily undo / fix any issues that exist due to actions you've taken as the root user. Additional charges may apply for our System Administration team to troubleshoot a server you have access to. I try my root pass, but ssh say that my pasword is bad. Thank you for contacting us about issues connecting to ssh as root. As a test, try to login to WHM with your password, and "root" as your username. If you are still unable to login to ssh as root, I recommend contacting Live Support so they can help you reset your password. I'm on a "Launch" plan (AFAIK not a VPS or Dedicated?) and don't see the icon in the AMP. What am I missing? This feature is only available for VPS/Dedicated hosting plans as we can not give out root access on a shared hosting server. You can log in via SSH or WHM with the root user and password.